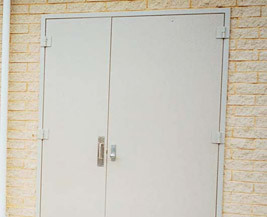 Lietzke Acoustic Doors are manufactured to provide sound transmission reductions where access/egress is required through walls of acoustic properties. The doors can be manufactured from various materials, each having differing acoustic properties, dependant on the STC rating required. 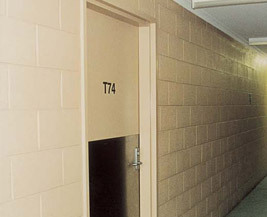 All door constructions share a common finish being 0.55mm thick Colorbond or Galvabond steel and the units must be fitted with the appropriate accompanying acoustic seals to both door and frame. Most locking devices and hardware can be factory fitted to the door. Standard finish is Colorbond but may be finished in factory applied durable polyester powdercoat over Galvabond. Available in Lietzke Rebate Edge for maximum STC rating or Lietzke Squareline Edge for lower ratings. For Architectural applications use a BW Style frame to suit the required wall thickness. Door shall be a Lietzke Metal Clad Acoustic Door with Colorbond facings over a composite acoustic core incorporating a Lietzke Rebate Edge treatment with PVC seal pre-hung in a BW series 1.4mm Zincanneal Frame with Hardware and Acoustic Seals pre fitted.